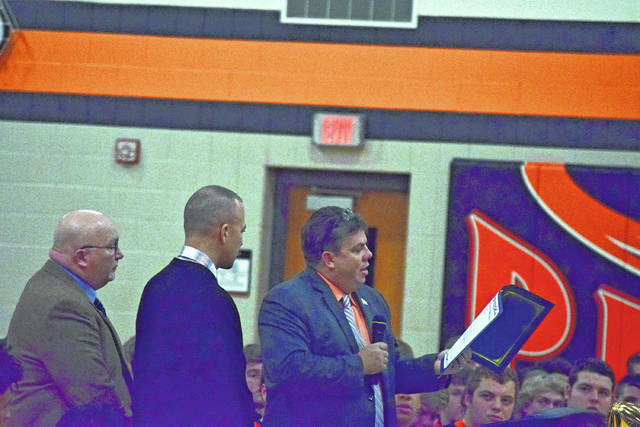 Scioto County Commissioner Chairman Bryan Davis reads off the proclamation honoring the 2017 Wheelersburg football program for winning the program’s second state championship. 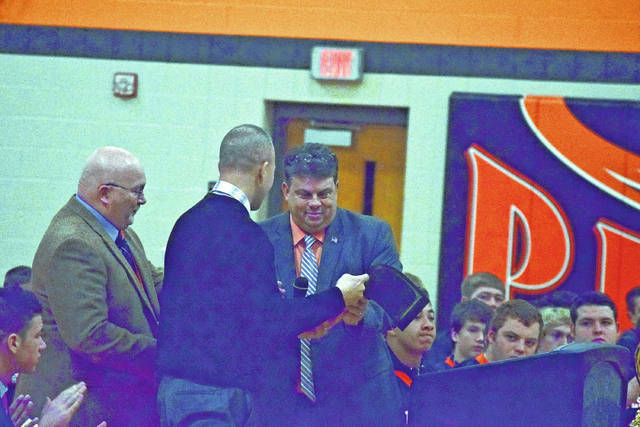 Scioto County Commissioner Chairman Bryan Davis hands the proclamation honoring the 2017 Wheelersburg football program off to Wheelersburg head coach Rob Woodward for winning the program’s second state championship. Bryan Davis may have been under the ground the day that the Wheelersburg Pirates’ football program won a state championship last Friday in Canton, but when the Chairman of the Scioto County Commissioners knew that Rob Woodward’s club had taken home a state championship trophy, it lifted Davis’ spirit from under the ground to Cloud Nine. And rightfully so. The 2017 version of the program, as a matter of fact, became just the second football program ever from Wheelersburg, and Scioto County as a whole, to win a state championship in football. So with that in mind, Davis made a special trip to Wheelersburg on Friday morning, and surprised the players with a plaque with a proclamation that officially honored the 2017 Division V State Champions alongside their 1989 counterparts to conclude the All-SOC II banquet that was held at Wheelersburg High School. As excellent as the accomplishment was, however, the support of Wheelersburg from other county schools in the Pirates’ quest to achieve the holy grail was, indeed, just as neat to take in. Posters and signs were made by Clay and Notre Dame. Social media support was shown by fellow SOC II rivals Minford, Valley, and West. East fans lined the streets to show their support for their neighbors to the east as two charter buses full of Pirates went by heading west on U.S. 52 en route to Canton. Even the out-of-county schools — in the form of Waverly — did much of the aforementioned as Wheelersburg returned home from its state championship quest. Even with his busy schedule, Davis, himself, couldn’t go without watching the contest. While working at The Christmas Cave in the White Gravel Mines out in Minford, Davis and several of his friends turned into the game via live streaming. With Wheelersburg’s #ReachHigher quest completed, the goal is now focused on maintaining that success. And while the goal of repeating certainly will be tough with having to replace linemen Alex George, Chris Bailey, Nic Parsley, CJ Hall, Caleb Browning, Austin Johnson, Caleb Varacalli, Luke May, Jeremy Cooper, and Josh Henderson, along with Lowery, Xander Carmichael, Bryson Keeney, Eli Ruby, Mack Dyer, Allan Patrick, Cameron Howard, and Aaron Sowards at the skill position slots, the return of star quarterback Trent Salyers and Co-Division V Offensive Player of the Year Tanner Holden will assure that Wheelersburg — who returns 3,408, or 57 percent, of its 6,022 yards of total offense — will have a chance to repeat in 2018.